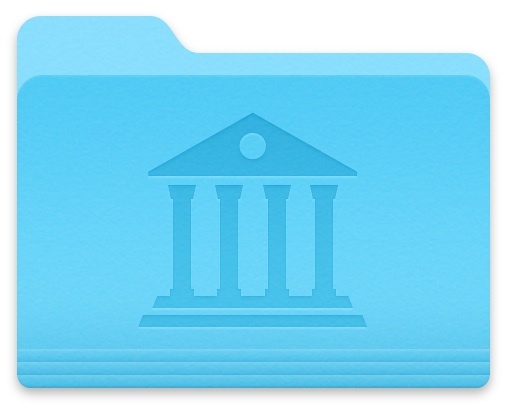 An individuals user Library folder contains personalizations, preference files, caches, and other contents specific to any given individual user account on a Mac. While most users won’t need access to their user account Library directory, some advanced users like to have easy access to that folder for a variety of purposes. All modern versions of OS X default to hiding the ~/Library folder to prevent erroneous access, but with OS X El Capitan, Yosemite, and newer, you can use a simple Settings toggle to reveal the folder if desired. The change is instantaneous and the users Library directory will immediately become visible in the user home folder, appearing as any other directory alongside the standard user Downloads, Documents, Pictures, Music, Movies, etc folders. If you want to keep this change, just close the View Options panel and the setting will stick for that user account unless you go ahead and disable it again. If you had previously set to broadly show hidden files across OS X then the Library directory would be visible in the users home folder even without this setting toggled on, but it would appear as a somewhat translucent icon along with other hidden folders and files. Opening the user Library folder will reveal the myriad of contents specific to that user account, from cookies, fonts, caches, color profiles, scripts, application files, autosaving details, and much more. Do not modify any of these files or folders if you do not know what you are doing and why you are doing it, you could easily mess something up. Generally speaking, if you don’t have a particular reason to reveal the users Library folder, you should not dig around in the directory. Apple is choosing to hide this folder for a reason, since it’s not really intended to be a user facing folder for average Mac users. 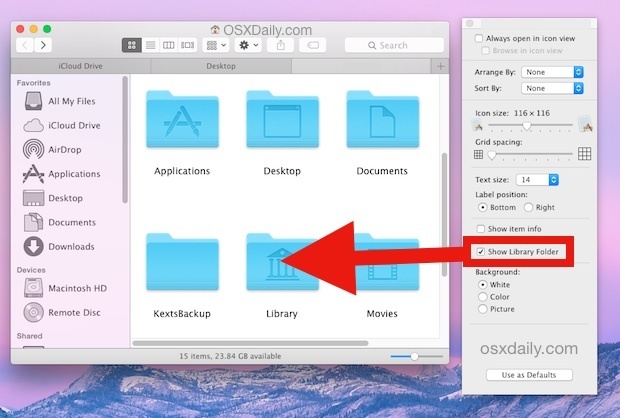 This simple settings toggle was actually first introduced in the prior release of OS X, and while in El Capitan and Yosemite or Mavericks you can continue to use either the Terminal and the Go menu to access the same library folder as well, simply setting it to be visible within a users home folder is undoubtedly the easiest way to have constant access to the folder. For this reason, the View Options approach is the preferred method for revealing ~/Library and the Library contents for a given user account in OS X, while older versions of OS X would continue to use different approaches. The use of “View” menu to check off “Show Library Folder” is also available in Mavericks 10.9.5. I like this tip, but being a cave-being, the instructions do not allow me to make the changes I’d like – the easy access to the Library folder. I find no ‘Go’ anywhere. Clicking upon the magnifying lens symbol, I get the Finder Search window. Please locate a 6 year old who can translate your instructions to a format I am able to grasp. If you can’t find the Finder Go menu, which is labeled as “Go” and all over the OS X desktop, you have absolutely no business being in any system folder let alone a Library folder. So, stay out of it, you don’t want to break something. And I don’t mean that as a bad thing, it’s like telling me to stay out of a toolbox – I can bang a hammer but I’m not particularly handy beyond that. And that’s A-OK. Everyone is good at some things, not everyone is good at everything. Computers are complex, Mac or not. It’s a shame that your humble and humerous post got such an idiotic and rude response. When I open Finder there is no “View” to click on. There is no toolbar at the top of the screen. I also cannot get out of Finder without opening one of the folders in Finder. Steve was “spot-on.” If one can’t find “Go,” then one has no business being in it. That’s not meant to be insulting…..
Wow! This worked great. Thanks for the help..
My Buick now starts on the first try and runs like a dream! I hope Dan can figure it out.. Sorry Dan.. This only works if the View is set to Icon. Kenny, It show also in the other views. Confirmed – the ‘show library folder’ option only appears in the view options if you’re in icon view. Thank you, you just saved my life. I wasnt able to find the show library folder until I changed to Icon and remade the process, then it showed up. Thanks for taking your time to post this detail! That totally helped. I was doing everything right, the only difference, I was in column view and none of the options looked the same. Thankfully I read the comments. I was wondering why the OSX updates were no longer reverting back to hiding the Library folder. Since I had been using the terminal cmd to unhide the Library, when this feature was introduced it automatically kept the Library visible. It should be noted for those unaware, if you use a back-up program other than Time Machine, these programs generally do not copy hidden folders, therefore the Library folder must be visible to back it up. In Finder, hold down Option and click on Go. Library will be available this way too. Hi. a question along the same lines as this useful info. I have upgraded to yosemite, and I see that when I right click on the Mac Hard drive and click on Get Info there is now only minimal info. It no longer tells me how much used space and free space there is, as it did in Mavericks. Can I change this to be more useful? All the info is there for my external drives, but not the main HD. Great article. Quick and simple. Thanks! My show view options only has 4 options – no “Show Library file” option. When in Finder choose GO – in the Finder Menu. Hold down the Alt (Option) key. The library folder is listed below the current users home directory. Make sure your view is set to Icon before clicking on view options. I had the same issue on Yosemite & doing this resolved it. I thought I would be able to find where the address book or contacts or whatever they call it now in the Library/Applications Support folder, but it isn’t there. Where have they hidden it in Yosemite? I cannot access Address Book on the Macbook Pro encapsulated hard drive and am trying to get the info into Contacts on the Mac Mini. Any suggestions would be helpful. This is insane. I still cannot make the “Show Library File” option appear. I’ve tried every suggestion in the comments. Thanks for wasting my day, Apple! I navigated successfully and made my Library folder and its contents visible. What I need to do is either increase the space in the Home folder for Mail (as requested via the two failed attempts to import mail messages) or find some other way to fix this. I do not want to have to go to each of the various email address locations separately. Great post. Saved my life. This took me a while to figure out so wanted to share. Have your home folder selected in the Finder. Change your view option from icon to whatever the second one is called (with the lines of info). Now goto View> Show View Options. The option will appear! Thank you!!! I just spent over an hour trying to figure this out! Every site I found told me to “Show View Options” and then simply click the “show library” box. But that box didn’t appear!! But now thankfully I found your note and yes, changing the Finder with that 2nd display option (View As List), and THEN going to Show View Options, I DO get that illusive “show library” box. I’ve clicked it and now my drama of the day is solved. Thank you! Icon view, list view, etc, does not matter what view you’re in you can access and enable the Library folder. It’s a folder, the ‘view’ simply changes how the folder is displayed. You spent an hour on enabling the library folder? Wow, not to be rude but you shouldn’t be enabling the Library folder, there is nothing in there that is appropriate for your user skill level. Hi, the last 2 hours i have spend my time looking for an answer on why on my view options i didnt appear the “show library”. Finally with that tip about holding down “alt” while being on “Go”, I got to see Library. So I wanted to thank you. 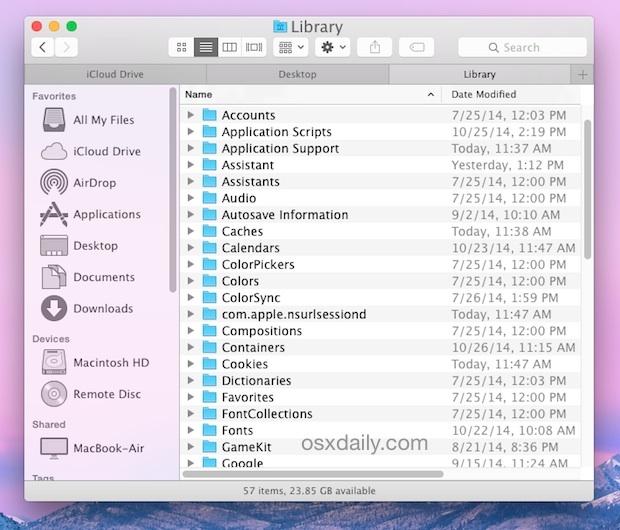 I need to make my user Library visible on my MacHD BACKUP drive (I’m in OSX 10.10.5). I can get to “Show View Options” for this drive, but “Show Library Folder” is NOT among the listed available options (at all – it’s not just grayed out or something; it’s not there). I’m hoping to recover some backed up data from the Library on that backup disk. Can you help? This assumes the backup drive is an exact replica of the internal drive, it will not work quite the same on a Time Machine backup which have a deeper network of drive paths. IF the drive with user Library is a Time Machine backup, access the Time Machine drive from the Finder, then open the “Backups.backupdb” folder and then open the date range of the file(s) you want to access, then navigate through the file system as you see it within those Time Machine backups until you’re in a Users folder, then the appropriate Users Library folder. Hopefully that helps, and hopefully that makes sense. Thank you very much for that! I was attempting to do the same but couldn’t find the article containing the Terminal commands that I used last time and none of the other solutions above resulted in a button to make the library visible. I managed to connect to and copy my missing email of the old hard drive that I had removed from my Macbook when the laptop died. Yes, I was being lazy about Time Machine backups – never again, I promise! Awesome tip and no hacks through terminal :) Thanks. The option shown in your image no longer appears in El Capitan when I follow your instructions. Any idea?